​Below is a compilation of sample programs or publicly available resources related to our goals in Ohio for adolescent health and well-being via sleep. Part 1 - "What you don't know about teen sleep, but should." Part 2 - "How to intervene in clinical and community settings." Part 3 - "Understanding the role of school start times." OAHP's Sleep Committee Chair presented at the 50th Annual Midwest School Social Work Conference on Child and Adolescent Sleep in October of 2017. The PowerPoint Presentation can be downloaded here. 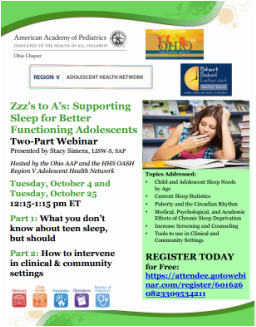 In March of 2018 Region V of the US Department of Health and Human Services collaborated with OAHP, Ohio AAP, Ohio Department of Health, the non-profit Start School Later, and OAHP to offer a webinar on the role of sleep in adolescent mental health and substance abuse. The PowerPoint can be downloaded here. A recording of the session can be viewed here. Educational curriculum adaptable to language arts, math, health, and social studies. Age-appropriate with downloadable lessons, assessments, and even fun crossword puzzles, word searches, and other engaging activities. Four curriculum options: K-2, 3-5, 6-8, and 9-12. This National Institutes of Health high school supplement series explores the biology of sleep and the impacts of sleep loss, including the risks of drowsy driving. Downloadable teacher's guide and and activities. Part of the Human Body Series, this high school curriculum offers a teacher's guide with links to suggested articles for students to read, discussion questions, activities, and reproducibles. This report was commissioned by Fairfax schools in Virginia and has been made publicly available. A team created by Children's National Medical Center analyzed the research on school start times, studied schools that successfully adopted later morning start times, and compiled an overview of considerations and recommendations for school exploring such changes.